Childish Gambino's creative video has spawned a user-generated 'Fortnite' version and it's great. It's unknown how much Donald Glover aka "Childish Gambino" plays the popular Video Games "Fortnite" or "Fortnite: Battle Royale." However, that game has made the creative juices flow for some video gamers. Glover's popular music video which looks at the controversies of race, murder, and entertainment in America, has now brought another version of the video from the "Fortnite" video game world. The latest Childish Gambino song "This Is America" is simplistic on its surface. It couples catchy singing and dancing before launching into an alternate beat with trap music and Gambino's verses. They included Glover rapping "Don't catch you slipping' up" and "Look at how I'm livin' now/Police be trippin' now." The song (NSFW) on its surface is relatively easy to recite and digest, but it's the accompanying music video (also NSFW) that went viral and helped to really show the message best. Childish Gambino has several shocking scenes in the hit video, including an early scene where he is simply dancing near a man in a chair playing the guitar. Just in time for the more dance-worthy beat, Glover shoots the man in the back of his head. Later on, Glover enters a room where a group of black choral singers are singing part of his song. As it transitions again to the trap beat, Glover whips out an assault rifle and guns down the choir. As of this report, that YouTube video has generated 239 million views and continues to grow by the day. It has had the effect that Gambino wanted, as it has generated conversation, with positive and negative comments all over the video's comment section. It also led to a fan-created version of the video using a popular video game. In "Fortnite: Battle Royale," gamers are pitted against one another in fights to the death on an island full of buildings, scenery, weapons, and other useful items. It starts out with 100 people and is whittled down until one player (or a team of three to four players) is left as the winning entry. It seems fitting that a game of this nature, which also features all sorts of creative rooms, buildings, and environments, would give way to a recreation of Childish Gambino's artistic music video. There's also the fact that players are able to gun down their opponents with a variety of weapons, including standard pistols and more heavy duty assault weaponry. 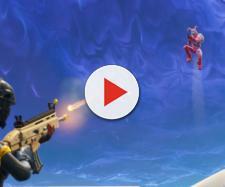 The "Fortnite" version of Gambino's video does its best to recreate the moments and themes of the original. It features players that are used in the game itself, dressed up in their combat gear or other available costumes performing dance moves that are also available as "bonuses" in the game. Not only do the characters do the dance moves from the video, but it seems to have been synchronized just right to have several characters dancing together, just like Gambino's video. The more violent scenes are also well put together, with background scenes also taking shape on a video game level. Perhaps the craziest part of all this is that old saying: "art imitates life." Gambino's song and video art were meant to do just that through his visuals. The "Fortnite" version does the same, with the irony attached to it that so many people in society believe violent games and other media can lead to violent tendencies amongst people. There are still plenty of open debates on that whole "entertainment leads to crime" concept, though. With that said, enjoying the creativity of the newest "Fortnite" version could help bring more awareness to the introspective song and video released by Gambino. Most likely, Donald Glover is happy to see that he's generated plenty of conversation, and imitations of his art will most likely generate further discussion.